One person died on spot in a tragic road accident in Kanubari circle of Longding district on Sunday afternoon. 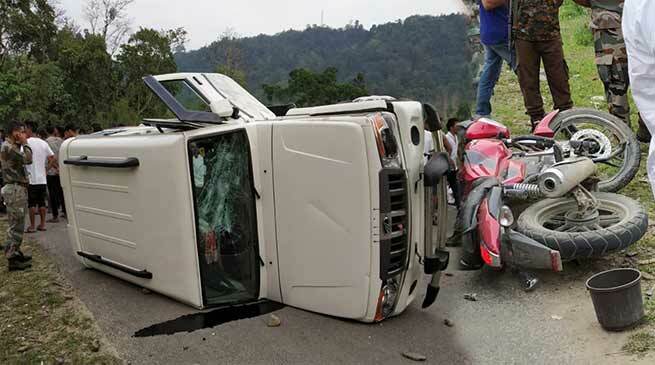 The accident occurred when a Bolero (new) A/F head on collided with a new motorcycle riding by a local youth near Market area on Sunday at around 3.30 PM. The rider of the motorcycle died on spot. Longding Superintendent of Police Rohit Meena inform that the victim is a local resident of Ollingtong village and identified as Mamwan Wamgjen, 25 years. All legal formalities have been conducted and the body have been handed over to deceased family for conducting last rite. Sp said. The Blero was driven by Kanubari police station ASI Noksey Lowang who was severely beaten by unruly mob. The bolero was also setting fire by the mob on the spot. He said. ASI have been sent for medical treatment at Dibrugarh in Assam. A case no 10/19 u/s-279/304 (A) have been registered and further investigation have been launched. SP Meena added.